I remember a friend’s mother teaching me how to make a kadhi with mango juice and cumin seeds. She was a Gujarati and a great cook – whenever I went to visit her son, a small plateful of snacks would appear like magic or an invitation to lunch. And thanks to her, I grew to appreciate the wonderful variety of vegetarian dishes that her westernised son occasionally sniffed at. 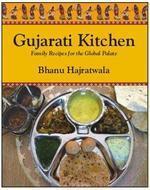 Bhanu Hajratwala’s treasure trove of Gujarati fare was originally learnt from her family in Fiji and then taken with her to the US after her marriage.